Journalists, especially from Index, noted that the dichotomy (I would even go further and say the Manichean allegory) for which Mr. Orbán is famous was put on display in starker terms than before. When speaking about “them,” Mr. Orbán referred repeatedly to “Soros candidates,” declaring in no uncertain terms that all non-Fidesz candidates, from Jobbik to the Democratic Coalition, were lackeys of George Soros. He painted the very diverse Hungarian opposition in a truly sinister light. Mr. Orbán emphasized: “We need to prepare for the reality that against our candidate will run a single Soros candidate everywhere.” Mr. Orbán was referring to attempts by opposition parties to find the single strongest candidate in each electoral district and field only him/her against the Fidesz candidate. And indeed, Ferenc Gyurcsány of the Democratic Opposition announced on Thursday that he is prepared to negotiate directly with Jobbik, in order to coordinate candidates in the ridings. 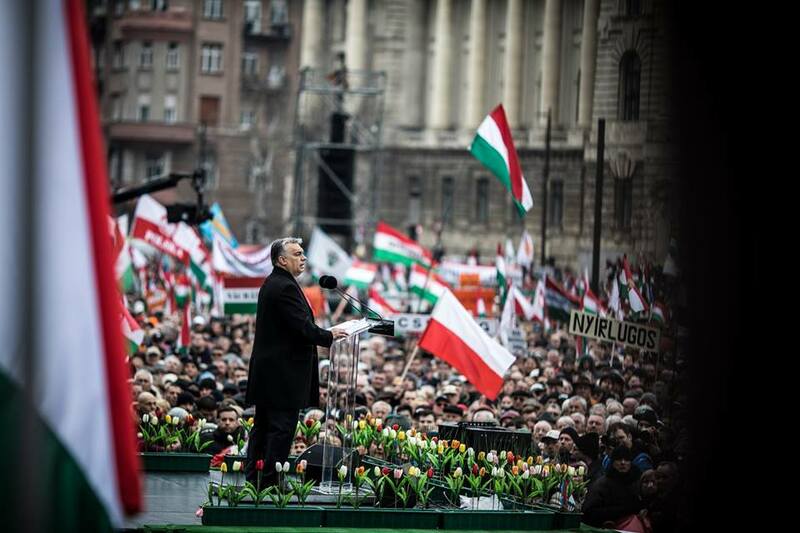 Viktor Orbán speaks on 15 March 2018 in Budapest, in front of Parliament. Although the prospect of formal cooperation with Jobbik is problematic for many (including for the author of this piece), Mr. Orbán effectively put everyone not associated with Fidesz on notice: if he wins on 8th April, retribution of a kind not seen before will begin against all who opposed his rule. That last line must be familiar to many of our readers: it was Jobbik’s election slogan in 2010. This is the key to your article Chris! I understand and respect that point of view but if the removal of the Orban criminal empire can only be achieved by such an alliance then I, for one, would vote for the Jobbik agreed candidate in my district if it comes to pass. Less worse of two evils…. Sometimes I try to ponder what your ideological arguments would look like (Those of the left in particular), if Hitler would have never existed. The Hitler part of the quote is less important than the overall point- replace him with Stalin, Mugabe or any other dictator of your choosing.The more important factor is that sometimes to achieve the greater good we need to make unsavoury compromises. Except for those on the extreme far left, the left despises authoritarianism whatever its pedigree. So I am sure Stalin, Mussolini, Castro, or Putin would do just fine. When you are right, you are right! The spirit of some aspects of this speech is divisive. All Hungarians are Hungarians and part of the Hungarian nation as far as I am concerned. That includes all who have Hungarian citizenship, as well as those who do not and live as a minority group in neighboring countries, because that is how others decreed it should be. And, no, there is no need to have a certain ideological outlook to qualify as Hungarian. 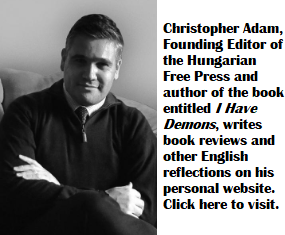 I do believe that the cult of ethno-cultural self-loathing has permeated Hungarian society and won some converts, but they are still Hungarians, with the right to express their opinions. As far as holding accountable, morally speaking, yes all politicians need to be held accountable. Legally speaking, I fail to see what if anything any opposition group has done what is or should be illegal, pending any new laws. The fact that I would not entrust them to run a gas station is another matter altogether! That is why we have the right to vote, for the least of all evils. Rather the devil I know than the devil I don’t. We know what Orbán stands for but have no idea what the other six as they themselves have no idea what so ever. If the base of their cooperation is “the removal of the Orban criminal empire” than Hungary is toasted. I do not regard Orbán Viktor as a criminal empire. If Orbán Viktor had not won the last two election, this country of Hungary would be in complete ruin, as will be if the Lefties take over. The Fidesz/KDNP government have done wonders to pick this country out of the doldrums, and they should be given praise for it. The labels that have been put on Obán Viktor and the ruling government, are from the Lefties and bare no truth. Go for it Orbán Viktor, the true Hungarians are with you all the way. On another note, I watched a few videos of the meeting. Have to say that your prediction that it would be an embarrassment because it would be all elderly people (which for some reason we do not seem to have respect for in terms of considering their opinions to be relevant), did not pan out. While there were surely more people over 40 than under, I’d have to say that I doubt any opposition group could muster even perhaps a quarter of the under-40’s people gathered in that crowd. I have no doubt that pictures will circulate showing clusters of mostly old people, but based on the videos I saw posted today, it will be a false representation. Peter aka commenter named econmagic at WAPO. I too looked at several videos posted by pro-Fidesz outlets (Origo, 888, etc.) and saw overwhelmingly people over 35. Very few young people. To find those you had to go to either the 2-tailed Dog Party march, Jobbik protest, or to the Student’s protest. As polling has repeatedly shown, Fidesz is no longer a young persons party. Time for them to change their name to “ősök”. As I pointed out, there were plenty of people under 40 from what I saw on the video, even though indeed, the majority were over 40. But given the size of the crowd, the number of people under 40 who attended that meeting far exceeds the overall crowds of any opposition meeting lately. So clearly, Fidesz has wide demographic appeal. I really don’t understand this obsession with trying to claim the young vote. As I pointed out before, perhaps Momentum will draw 50% of their votes from people under 40. So what? With perhaps 2% overall suport, Fidesz will likely have 10x more people under 40 vote for them, while probably earning 50% of the overall vote. Do you believe a young shithead, who never had to pay major bills, never had dependents is wiser than someone who lived, raised a family, experienced responsibility, saw the consequence to things going wrong? Most young people don’t even give a hoot about politics and will never vote until they get older. The ones who are politically active when young, and keep same convictions later in life generally tend to be on extreme fringes ideologically, because extreme ideas tend to raise the interests at that age. The rest change their minds, becoming wiser. That is the general history of the young vote. In my view, any group that appeals overwhelmingly to this demographic is dangerous, because it pushes irresponsible ideas. “Do you believe a young shithead”. Your respect for young people really shines through! You don’t understand the obsession, yet you are the one who first brought them up. You sound a bit nervous about those young rabble-rousers. The youth are the voters of the future. Current trends show young people remaining progressive into their middle-age. Your generation will soon be gone. Szia! Did you happen to notice the election results in Austria, Italy? How about the gay vote in Europe? One would think it ought to be near 100% progressive, right? It turns out AfD in Germany, and Le Penn in France both did better within the gay community than they did with the general population. I think, if the “progressives” cannot even retain the gay vote, you ought to perhaps start asking some questions in regards to your values. But, yes, keep the faith. I do believe as well that your ideology will retain the reins of power long enough to destroy the Western World as we know it. Between the institutions of higher brainwashing, the media, in business, it looks like you got it! The PC dictatorship will hold! a super-coalition by all the opponents. That is the only possibility of either side getting a majority vote. Or all else may just end up to remain the same. Now, which one would the reader would prefer ? Than there is no reason or purpose to write a reply ! What a charming turn-out from the troll gallery, who never fail to rise in defense of the indefensible. I see “Mr. Morrison” came out of his self induced slumber in the Falk Miksa utca, or was it Hollán Ernő, “Robitusson” ? Please cough. Peter, and Bendy-goose have risen to the occasion already. Oh what fun, what scintillating prospects for a learned conversation following Mr. Adam’s news of the gathering storm over Hungary. God save us from these lunatics in Canada. the promise of eight years ago, reminded the readers that it never materialized. But ” ….to seek moral , political and legal recourse.. ” is not a threat ! He could even have a change of heart. The absurd contentions pile up: Orbán is for democracy, migrants are crowding on the Hu borders, Soros rules the world, Vienna is a dirty, dangerous place, as is WEurope , but Orban’s Hu is prospering, it’s the safest place in Eu, and Orban is a Eurooean leader ( no matter no one knows these ). Last time one could hear similar c..p was 1950s, early 60s. Welcome to Orbanistan. Yes Andriska, I came out in order to compensate for your “Know nothing but have strong opinion about everything” approach. As I stated somewhere else that if anybody on this site is a troll that is YOU in a very ugly impolite way. And showing the signs of rapid aging too. Robert, didn’t you leave this site in the highest state of rage just a few months ago? What brings you back? I’m sure you could find yourself a nice home within the vast taxpayer-funded Orban media world. Yes,Mr.Orban will do his best to take out Hungary in the years to come from the E.Union.Brexit will happen sooner or later because Brussels are to willing to change together with Germany…we Hungarians have to find new friends for our Policy and believe.We are a Nation of Freedom fighters and will never sorrender … Suveranity for our Country is not negotiable and time can not change anything Regarding this ! Good luck with the failed state of Russia! Putinistan’s GDP per Capita was cut in half over the past four years and the poverty rate has reached it’s highest in the last ten. No sign that they will emerge as a global economic leader anytime soon. Russian science is considered lagging far behind the global scientific community. Their economy is undiversified and prone to shocks. On the global stage they politically huff&puff with their hybrid war. In reality it is a backward and weak country. Don’t worry about Suveranity. It’s a terrible skin condition, but easily treated with topical ointments. However, I would be worried about selling Hungary’s sovereignty to Putin or Xi Jinping. Leave the EU then why don’t you? As Brexit has proven, membership is not compulsory! The chief of all the trolls has never have anything meaningful or worthwhile to contribute. Only the same and the rudest insults, as always. But make note of this, what I stated above could be reality if either side would do it. Otherwise, just as I stated, it will be all the same again. Yes, the same ringleader, Orban in power. Now will that make you and your boss happy ? Too bad that not able to comprehend reality, just keep repeating the constant bitching. Well, he who does not get it, because he does not have it. Oh, excuse we have a real bad time now. Because the Jewish-star on the Suit would be better. You ‘forgot’ to cite his words before the above sentence. Obviously it wouldn’t mean what you try to sell here.